UMAG has become the favourite destination of many tourists as it is the largest summer resort and the largest Croatian ACI marina in this part of the west coast of Istria offering its guests the best in terms of accommodation, sports, entertainment and leisure activities. The towns in the surrounding area have not been neglected either thanks to the fact that they are only six to seven kilometres away. Holiday resorts of Katoro with the beautiful beach, Polynesia, Stella Maris and Punta with the crystal clear blue sea, may be described as the European oasis of the sports tourism - active holiday adjusted to the habits of the urban man and woman. Of all the sports, tennis is the most popular here. Apart from tourists playing tennis for fitness and relaxation reasons, local tennis courts often welcome a number of professional players too. 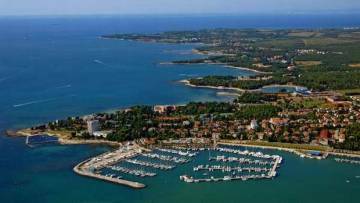 Besides, Umag is the venue of a high amount prize money ATP Tour - Croatia Open. Novak Djokovic, Andy Murray, Stanislas Wawrinka, David Ferrer, Rafael Nadal, Marin Cilic, Gael Monfils and many other professional players come to Umag every year. Holiday resort facilities along the Riviera offer lots of sporting and leisure activities. Among other things, there are football, handball, volleyball, boccia, horse-riding, boat ride, sailing, windsurfing, water-skiing, diving, swimming, spear-fishing, and so many more. There are also sport schools for different kinds of land and water sports. Today Umag is the leading holiday resort when it comes to private accommodation. This town and its inhabitants were the first to provide their guests with the possibility of spending their holidays in private accommodation. This too confirms the hospitality of the citizens and the warm reception given to their guests. Umag lies on the north-western coast of Istria. It was built on the remains of what used to be a Roman settlement. Narrow streets interweaving with one another, and the attractive nucleus of the town have remained preserved. Umag is not only a modern tourist centre but, at the same time, it is a north-western gateway to the Adriatic Sea. The history of Umag is most interesting: the Romans fortified the town and connected it to the hinterland; the town was conquered by the Croats in the 9th century, and set on fire by the Genoeses in the 14th century. Parts of the town walls, the tower, and the Renaissance and baroque buildings still stand. The front of the parish church of Assumption of St. Mary the Virgin and St. Peregrinus (1757) is remarkable for its portal. A relief on the church wall shows the figure of the town patron, St. Peregrinus from 14th century. The church has a most valuable inventory.